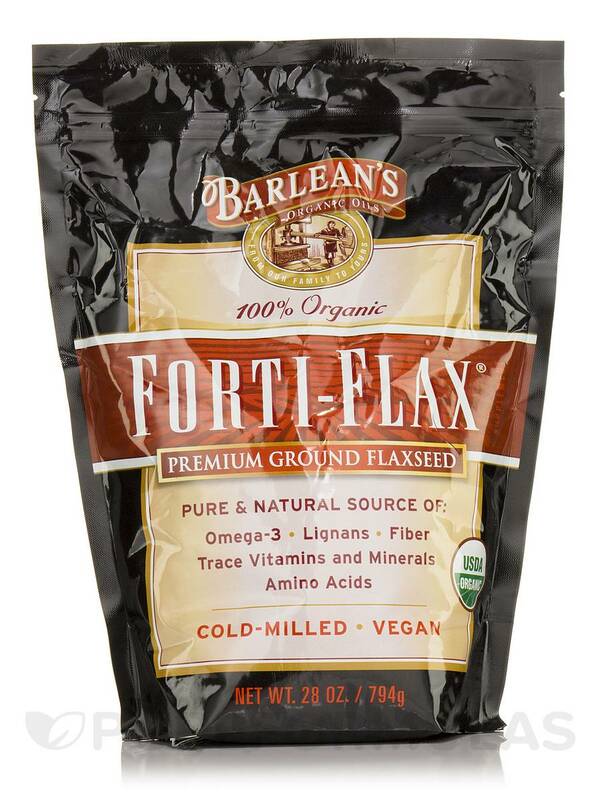 Forti-Flax Pouch by Barlean's Organic Oils is Nutty and full of Flavour great fiber too. I have used Forti-Flax Pouch by Barlean's Organic Oils for several years and remain satisfied. I have purchased Forti-Flax Pouch by Barleans Organic Oils several times and I am very satisfied. Nutritional Powerhouse: Extremely rich source of Omega-3‚ dietary fiber‚ protein‚ mucilage‚ phenolic compounds‚ vitamins‚ major and trace minerals and amino acids. Highest Quality: 100% certified organic‚ certified kosher‚ free of pesticides and herbicides; made with select flaxseeds from North America. Advanced Process: Proprietary cold-milling process delicately liberates vitamins‚ minerals‚ amino acids‚ lignans and phytonutrients without damaging delicate Omega-3 fatty acids. Supports Healthy Body Function: Soluble fiber helps maintain blood glucose levels already within a healthy range and supports a healthy intestinal tract* – great alternative to unsavory fiber supplements. Convenient: Easy addition to a healthful diet‚ no special preparation needed‚ just sprinkle on your favorite foods or stir into juice or water. Great Taste: Adds a crunchy‚ nutty flavor to baked goods and cereals and tastes great sprinkled on banana slices. Fiber: Both soluble and insoluble dietary fiber. Fatty Acids: Essential Omega-3 and 6 as well as Omega-9 in an excellent balance to support health*. Vitamins: Eight essential vitamins . Minerals: Four major minerals and four trace minerals. Amino Acids: All 10 essential amino acids (complete protein) as well as eight non-essential amino acids. Phytonutrients: Lignans‚ Phenolic Acids‚ Flavonoids and Phytic Acid. Other ingredients: Freshly cold-milled‚ 100% organic‚ pesticide and herbicide free‚ select flax seeds. 2-4 Tbsp. daily. Mixes easily in water or juice. My mom swears by this Forti-Flax Pouch by Barlean's Organic Oils and recently got me into. I use it in oatmeal in the morning or scrabbled with eggs for pancake like consistency. Maybe i'm weird but it helps things running (no pun) smoothly. Forti-Flax Pouch by Barlean's Organic Oils tastes wonderfully nutty, crunchy and fresh. Mixes especially well with oatmeal and yogurt. Forti-Flax Seed the miracle food! 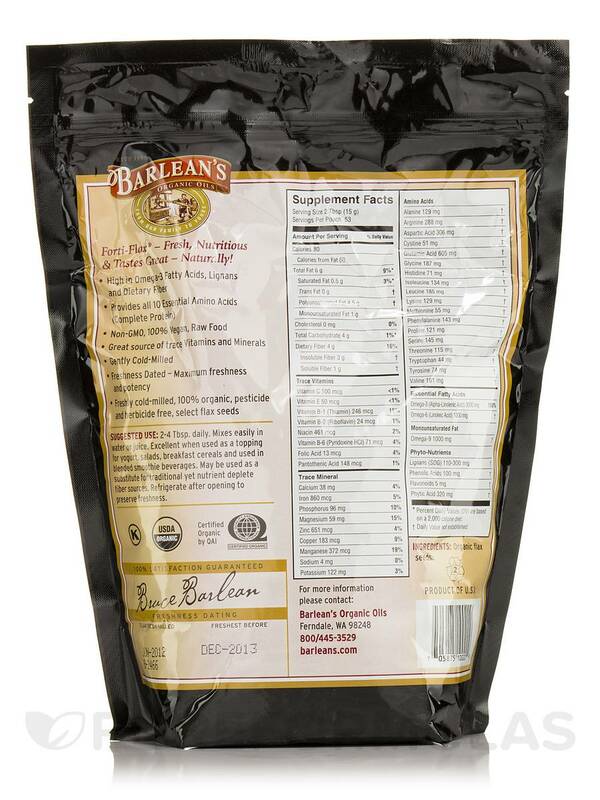 The pros are all the nutrients in this wonderful food product and you dont need to hold your nose while ingesting it. It tastes good and is good for you a rare combo. Flex meal is good for you and helps to be regular. Forti-Flax Pouch is a good product. There are other brands out there as well maybe you can even save a few bucks more. Forti-Flax Pouch has a great taste and added fortification makes it a winner. Forti-Flax Pouch is great. It tastes wonderful and is so healthy. You get a huge amount of flax for the price.